Ugli Studios is nearing completion of their second anthology; Ugli Studios Presents #2. The anthology is scheduled for release in the summer of 2013. Ugli Studios Presents #2 contains three stories from artists Jason Lenox, Brian Allen and Joseph Freistuhler. The anthology will be available during the summer of 2013 at select private signings by each of the artists involved and will be making its official release at the Baltimore Comic Con on September 7th and 8th, 2013. Jason Lenox is an illustrator who specializes in pencil and india ink illustrations and sequential artwork. Jason has done pinup work for Viper Comics, The Aizan Demo Project, Wyrlwynd’s Kantara Comic and recently had a short story published in Gray Haven Publishing’s Dark Anthology. He has also published two books under Ugli Studios; The Art of Jason Lenox Vol 1 and Ugli Studios Presents #1. Joseph Freistuhler is a freelance cartographer and illustrator. Joseph has several maps being published in the role-playing game industry. This will be his first story under the Ugli Studios label. Brian Allen is a freelance artist. Brian’s first graphic novel, The Ends, was voted Best Sci-Fi Webcomic of 2009 by TheDuck Webcomics and has been published as The Ends #1 and #2 by Ugli Studios. “Ugli Studios dares to tell the stories the big guys refuse to because they’re playing it safe!” – Don Everett Smith Jr., comic book writer and author. 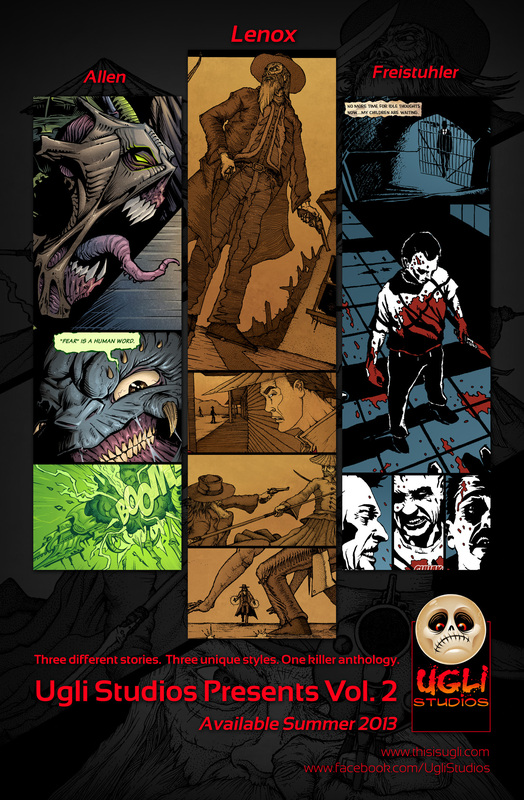 Ugli Studios Presents #2 contains three different stories told in three unique styles resulting in one killer anthology. A violent western set in the backdrop of a dangerous Northern California town in 1850 as a land deal gone wrong turns the wheels of violence on the guilty and innocent alike and only one man is willing to stand up for what’s right, Elijah Holman. A dark but humorous story about a slave’s final attempt to deliver a mysterious package to the heart of an alien ship, and to send the invading creatures back home for good. When a serial killer clones himself repeatedly to create the ultimate killing machine he learns an important lesson about natural selection. Ugli Studios was founded in 2011 by Jason Lenox and David Paul. Ugli Studios primary focus is on creator owned comics and has become a showcase for several emerging artists and creators. Ugli Studios previous releases are Ugli Studios Present #1, Art of Jason Lenox Vol 1, The Ends #1 and #2 and The Courier. Ugli Studios will be using the crowd funding site Kickstarter to self publish Ugli Studios Presents #2. Ugli Studios and Jason Lenox have had two successful Kickstarter campaigns previously. Kickstarter had become the top site for independent creators to finance their publishing efforts. This entry was posted in Columns and tagged baltimore comic con, brian allen, comic anthology, jason lenox, joseph freistuhler, ugli studios. Bookmark the permalink. Follow any comments here with the RSS feed for this post. Post a comment or leave a trackback: Trackback URL.